Sometimes you have to move to take a new job. It’s a big decision. One that should be weighed very carefully. Uprooting a family is no easy task. At Spectrum Brands, we’re lucky. Our World Headquarters is located in Middleton, Wisconsin right next to Madison. Madison was the place we called home for many years until our recent move to our new “green” building. Either way, both cities have earned titles like “best place to live in the US” multiple times. Sometimes we feel like we’re bragging but if you’ve got it, flaunt it. Besides being an unbelievable college town, we’re located on an isthmus, which means we’re surrounded by two lakes. There’s a fantastic food scene and a great biking scene to burn off all those calories. (Cheese and beer. Lots of cheese and beer.) Madison is also the state capital of Wisconsin — and our capitol building is gorgeous. There’s always something going on at the capital square, our favorite event being one of the nation’s best farmer’s markets. We could go on bragging but we’ll let these recent titles speak for themselves. This love affair has been a long one. 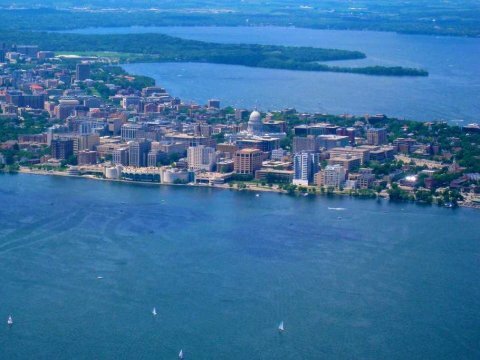 Here are even more reasons why we love Madison. What do we look for when we’re interviewing candidates? Well, we created this handy list just for you. It’s not only what we hold prospective employees to but it’s what we expect from our current employees as well. Take these principles and apply them to your cover letter, resume, and reflect on them during your interview. The more you can display these traits during your interview process the better! Entrepreneurial Spirit: takes calculated risks with good judgement. Passion for the Business: displays enthusiasm and energy. Assure Project/Service Quality: high standards of accuracy and excellence. Takes Out Costs & Controls Spending: considers cost in everyday work. Highly Responsive to Customers: exceeds expectations of customers. Sense of Urgency & Being Quick to Market: use decisiveness to obtain results. Leadership: energize others toward business goals. Win with the Spectrum Value Model: align daily actions with our six value principles. FYI You can read the full in-depth list with detailed descriptions over at our Spectrum Brands Careers site. Job interviews are stressful. You should spend most of your time preparing your pitch, practicing interview questions, and researching the company and the position. But there’s also one more thing to consider: first impressions do matter. Here’s an easy-to-use checklist of all those little things that might accidentally slip your mind when you’re stressing before your big day. Run through this list and you’ll step into your interview feeling more confident, calm, and collected. 1. Pick out your outfit and iron it. It’s amazing how much better and more professional you’ll look with crisp and clean clothing. 2. Find a tailored, professional-looking briefcase, laptop bag, or tote. That college backpack isn’t going to cut it. 3. Look up directions so you can perfectly time when you should leave. Give yourself at least 15 minutes of wiggle room just in case. 1. Skip the perfume or aftershave, as well as that cigarette. Many people are sensitive to smells and you don’t want to give anyone a reason not to like you. 2. Pack a water bottle and some tissues. Now if you get thirsty or you sneeze, you’ll be prepared. 3. Print a few extra copies of your resume just in case. Always better to have them on hand. 1. Get rid of that gum. 2. Take a quick bathroom trip or a glance in a mirror. Make sure you look presentable and there’s nothing in your teeth. Practice your smile. If you have an upcoming interview, you’ve probably practiced your pitch and perfected your interview questions, but did you even think of the small talk? It’s an easy thing to overlook. But if you find yourself tongue-tied at the beginning of an interview it can really throw you off your game. Luckily, there’s another option: smooth talk yourself into a casual conversation and start the interview on the right foot. Easier said than done, right? Here are a few conversation starters for those first crucial moments of your next interview. You can take this one as far as you’d like. Thank the interviewer for his or her time, and even reference his or her busy schedule like, “I hope I’m not hugely interrupting your busy workday.” Hopefully they’ll give you something back. If there’s an awkward silence, move on to step two. This is a sentiment you need to express at the beginning, middle, and end of your interview so you might as well blatantly say it right off the bat. Be sure to have a follow-up sentence here because you might get a sneak attack question like, “What excites you most about this company and this position?” Eek! Better have an answer up your sleeve. People like to talk about themselves. So let them! Be sure you have a response in mind just in case they return the question and ask about your weekend plans. It’s best to edit your weekend plans and shed a positive, interesting light on whatever it was that you did. It’s easy to fill in an awkward silences. Be it the freak snowstorm that just hit yesterday or the big loss of your city’s football team or a bit of interesting industry news, say something lighthearted, short, and chuckle-worthy to keep the conversation flowing. Feel free to brainstorm a few scripted conversation starters pre-interview. How do you fill the awkward silences during an interview? We’d love to hear your best lines! Comment below or Tweet us. The Brazen Careerist wrote a great post, The 3 People You Absolutely Need In Your Corner to Succeed in a Career. Who are they? A mentor, a coach, and a sponsor. At first glance, they might sound like the same person. But they each play a different role in the success of your career. Your mentor focuses on your growth. Your coach analyzes your performance. Your sponsor watches your back. Most people will be flattered if you propose a mentorship/coaching opportunity/sponsorship. Set up a phone chat via email, or a coffee date if you can. Be up front with their time commitment — a coach would require more frequent check-ins than a mentor. You’ll likely have to instigate the first few meetings or set up meetings in advance on a shared calendar. But the effort it takes to get a routine going will help your career immensely in the long run. Do you have a mentor, coach, or sponsor? Comment below or tweet us!